The casket can account for as much as half the total funeral bill. Knowing a few things about them can help you make more responsible choices when it comes time to buy one. 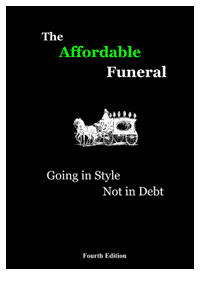 Many funeral directors will dispute the percentage, perhaps even showing you that same tired old 1972 newspaper article which shows the casket accounting for only 14% of the funeral, but consider this; the NFDA says their average funeral service (without burial plot, container, opening-closing fees, etc) costs about $5300 for 1999. Now note that their own survey showed the ‘average casket price’ to be about $2200. Don’t know who does their math, but I’ll bet the IRS would be interested. Caskets are typically available in Metal, the choice of about 60% of families, Wood, roughly 34% of families, and ‘other’ meaning fiberglass, polymers, etc. The most common metal in caskets is a lightweight steel alloy, which is stated in ‘gages’ from #16 to #22, with the 18-gage (roughly the thickness of a car fender) and 20-gage (thickness of a stop sign) being the most popular. It is noteworthy that a 20-gage casket will often cost you $1,000 or so less than an 18-gage unit. Neither you, the deceased, nor those attending the funeral can tell the thickness of the steel by looking, and the thickness matters little in ‘preservation’ terms since either unit will outlast the remains by a century or two, so why not save a few bucks and ask for a 20-gage unit? Exotic Metals such as Stainless Steel, Copper, and Bronze are also available at a higher price than basic metal. Stainless is also stated as its gage (thickness), with 18-gage being the most common, and 16-gage usually the choice for brushed finishes. Copper and Bronze caskets are typically described as ’32-ounce’ or ’34-ounce’, the weight of one square foot of the material. Bronze is easily the most-expensive of the lot, with prices typcially starting around $5,000 and going up to $50,000+. Anyone rich enough, or fool enough to pay this kind of money for a casket won’t likely be reading this, but for anyone who wants to go the extra mile for top-of-the-line, check our casket catalog for a much better price on these. Wood caskets come in a wide range of materials and prices. Unlike metal caskets, wood units do not come with a ‘seal’ or rubber ‘gasket’ and are never stated as ‘protective’. The porous nature of wood makes this even more meaningless than on a metal casket. For the softer woods like pine and aspen, prices can start under $1,000, though these will be rare in the funeral homes. Hardwoods such as Walnut, Poplar, Maple, Oak, Rosewood, and Mahogany typically bear a higher price. Other materials are expensive, with fibreglass units wholesaling at $1100 and up to the funeral homes, by the time they mark these up their typical 300 – 500% they are quite an investment. Per EPA studies of material in land-fills, perhaps the best overall material to fashion a casket from would be Styrofoam! Really, this light-weight material has a life-span, even in the most caustic of environments, in the thousands of years. And, since the casket will likely be within a concrete or metal vault, its load-bearing capacity is moot. Don’t expect to see these anytime soon, however. Disparaging remarks about ‘a cheeseburger box’ kept most families from using them when they were available.